There’s Still Time to Plant for Summer! This week I have been clearing a couple of my raised vegetable beds of cabbage, garlic, shallots and ancient pea vines to make room for a few last chance direct sowings of carrots, turnips, chard, beets, beans and squash. Some might term this a fall sowing, but mentally I’m not quite there yet, preferring instead to savor the feeling of pushing bean seeds into soft soil before brassica seedlings on feed store racks signal that the season is shifting out there. A bed that housed potatoes and garlic is ready for a last summer sowing of bush beans. Many gardeners don’t think of second (or third) sowings of some of their favorite summer crops. Still other gardeners try not to think of second (or third) sowings of some of their favorite summer crops. ‘Isn’t once enough?! ?’ they cry from sun-baked gardens in the middle of the day. Apart from the obvious response of “What are you doing in your garden in the middle of the day?” I would answer thus: Keeping a few summer crops going through what can only be termed ‘tomato and pepper season’ adds a bit of variety to the menu in early September. This second sowing of Bright Lights chard in a richly amended bed broke all speed records several years ago – 5 weeks from seed to table. Some crops, such as beans or turnips, have a remarkably quick seed-to-plate timetable (approx. 55 days), others, such as carrots, will take some time to germinate – adding a couple weeks of babysitting to the process. Checking packets for “Time to Harvest” numbers allows you to count back from your official frost date – or with fleece in hand, from your non-official one. Not all cultivars are the same (sort of the point actually), so checking those numbers carefully is important. 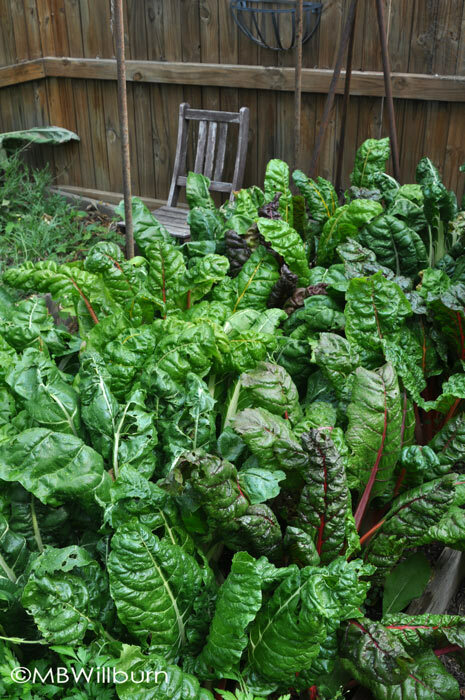 This might be the time to try some of those cultivars you wanted to take a shot at but upon which you didn’t wish to base your entire summer crop (‘Neon Lights’ chard here – 60 days); or to sow one more row of ‘summer’ crops you know will take you into fall (such as my new sowing of ‘Short Stuff’ Chantenay carrots from Renee’s Seeds – 68 days). Though it is generally not ‘done’ according to many official timetables, I find that planting a late (but not too late) sowing of summer squash ensures that I actually taste summer squash in the summer. The squash borer has by this time finished her egg laying (the wilting results of which can be seen throughout Mid-Atlantic gardens right now), and there is still enough time for fast growing patty pans and tender six-inch harvests of one of my favorite long varieties – ‘Gold Rush’ (45 days). There are challenges for seedlings in mid-summer of course. The most pressing stem primarily from a lack of moisture. It is just too easy to get all fired up about a new sowing, water it once a week and think all is well. Spring techniques won’t work during the summer. Our rains are sporadic and the summer sun is brutal. Seedlings planted ¼ or ½ an inch deep will dehydrate in a few hours. Even if you’re currently forcing your tomato plants to search ever deeper for water, give your seedlings a break and make it a point to water them every day until germinated – at least every other day thereafter. Floating row covers can also help to prevent dehydration. 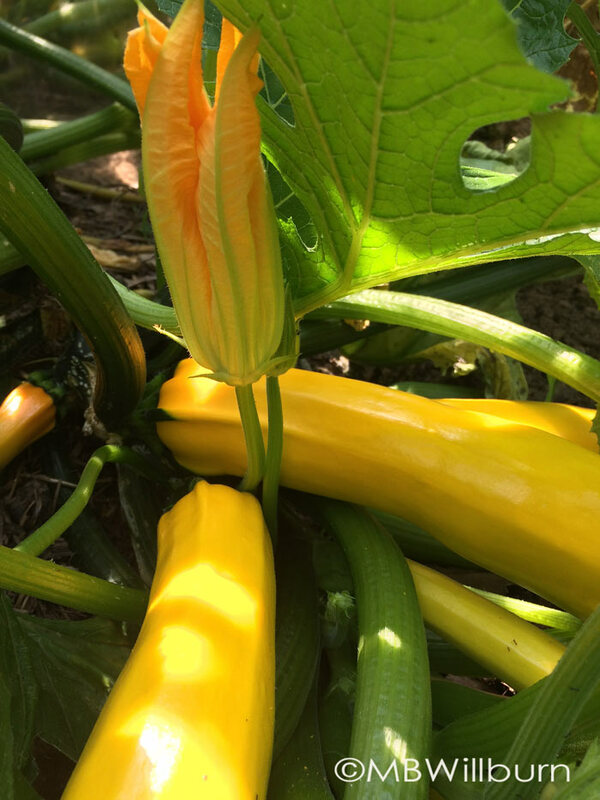 ‘Gold Rush’ summer squash – an All America Selections winner 35 years ago and still a fantastic choice for vigor, cropping, and let’s be honest – beauty. Pest populations are usually quite high in mid-summer and you may find that seedlings are being nibbled just as soon as they come up. Again, floating row covers; but preventative beer traps for slugs and earwigs work extremely well too. Most creatures will take a drink over a meal – even if it’s their very last drink upon this earth. I use netting to protect seedlings from birds, groundhogs and deer, but even so, there are casualties. Some summer crops will now need to wait until next summer. Eggplants, tomatoes and peppers are good examples. Unless you can find strong orphaned plants at garden centers, or are planting under glass for fall, it’s going to be hard to get these plants to full maturity (not just the odd fruit) before cold weather hits. And with regards to that cold weather, many vegetables are waiting for it and will have trouble germinating under the hot sun of mid-summer. Direct sowings of lettuce and spinach, etc… are officially ‘fall crops’ in the Mid-Atlantic, and their time is coming – but not yet. Still, gardening is about experimentation (hence my ‘against-advice’ summer squash success). Do what works for you and for Heaven’s sake, make a few notes so you can do it again next year. Very soon all will be cabbage and sprouts, mums and asters. Let’s make the summer last a little longer. For more information on Mid-Atlantic area planting recommendations, see Publication HG-16 by the Maryland State Extension or the newer GE 007 ‘Vegetable Planting Calendar’ color-coded graph. 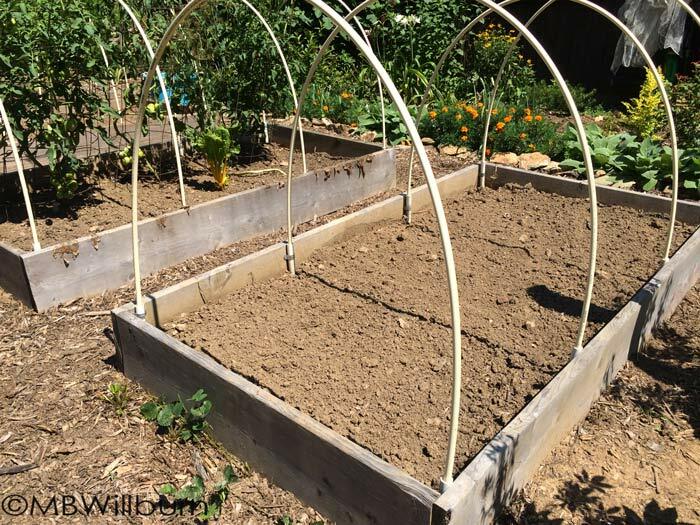 Are the hoops over your vegetable bed made of PVC pipes? Yes Runa. They are flexible 10ft sections of 10foot, three quarter inch (sometimes I cut them to 8ft) CPVC that slot into 1 foot sections of 1 inch PVC that has been attached to bed with strapping. Very handy and can be easily removed when I don’t need them.